Before you start, if you're on a Web Hosting, Reseller or Managed VPS plan make sure you're using our nameservers. Use ozdns.com.au to check, the first nameserver should be either nssyd01.crucial.com.au or nssyd01.aumanaged.com or nssyd01.clusterdns.net If you're on a VPS or Dedicated Server you should have your own nameservers set up. 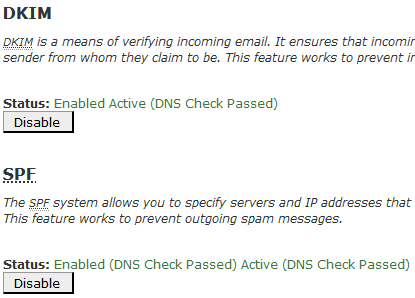 SPF and DKIM are 2 features you can easily enable to make sure your emails go to their destination (instead of ending up in spam folders) and to reduce the amount of spam emails you receive. 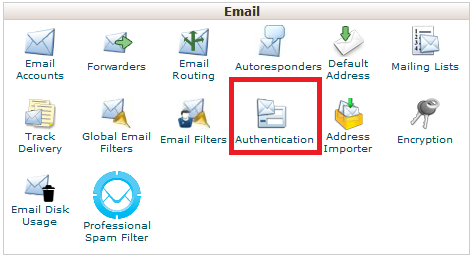 This article helps you set up an External SPF record is. 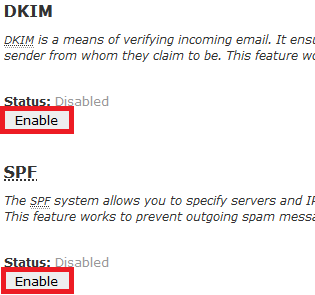 For an explaination of what SPF and DKIM do, and how they work, click here. Once enabled you will see the bellow screen. Note that if you're using a Crucial Web Hosting, Reseller or Managed VPS hosting service, this is not the final step. Note: SPF records normally propagate and start working between 15min-4hrs after you update them, but in rare cases can take up to 24hrs.